Here’s a free show for you folks in Australia. Rare Finds their iteration for their monthly club night with performances from a few good local bands. Following a launch night that reached venue capacity at The Sly Fox in Enmore, Sydney PR agency and label services company, Rare Finds, have announced the line-up for the second iteration of their monthly club night, RARE FINDS #2. Carrying on with the goal of curating one of Sydney’s strongest showcases of home-grown indie music, Rare Finds have collated another line-up of emerging Australian acts on a single stage, including Brisbane-based indie-pop outfit, Hey Geronimo, Central Coast indie-rock sweethearts,Sea Legs, and Sydney newcomers, Polish Club. Following a string of free-entry residency shows at The Black Bear Lodge in Brisbane throughout April, Hey Geronimo are set to bring the party to Sydney to showcase cuts from their recently completed and highly-anticipated debut album (due later in 2015). Sea Legs have just completed 12-months of touring alongside the likes of The Growlers (USA), British India, Jebediah and The Griswolds, and RARE FINDS #2 will see them launch a new single from their sophomore EP, which is scheduled for release in the coming months. Opening up the night’s proceedings will be Sydney upstarts and recent triple j Unearthed winners,Polish Club, who have most recently achieved a triple j spot rotation add for their high-energetic and garage-rock infused single, ‘Did Somebody Tell Me’. 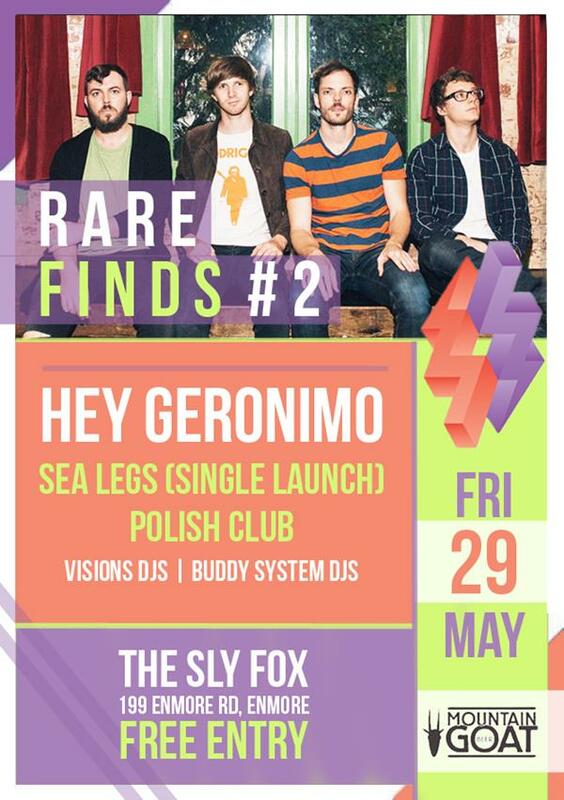 Rare Finds #2 will again be held at The Sly Fox in Enmore – the home to last month’s Rare Finds launch party that featured Jenny Broke The Window, Food Court, Hedge Fund and Winston Surfshirt. Entry is free for all patrons.